Pull this verified business contact and email database of payroll managers and personnel directors. Reap the benefits of having the direct contact information of many payroll professionals in one organized payroll and personnel directors email database. This professional email list based on job title puts you in touch with powerful payroll and personnel decision-makers. Don't work overtime hunting for the direct contact data you need. Buy our B2B email database of payroll managers to get ready-to-use contact information all in one place. Calculate which targeted email list you need, then create it easily with our custom list-builder tool or download a ready-made list like this one! This data product includes professionals with the job title of payroll manager, director of payroll, personnel manager, and other relevant, high-ranking positions in payroll or personnel departments. This personnel and payroll manager mailing list is full of not only those working with HR departments but those payroll professionals who have the power to make changes and buying decisions. Payroll directors are often in charge of the entire company's payout, managing the payment of salaried, hourly, and commission-based employees. They may also have a team of clerks under them and decide on which software or IT tools to choose. 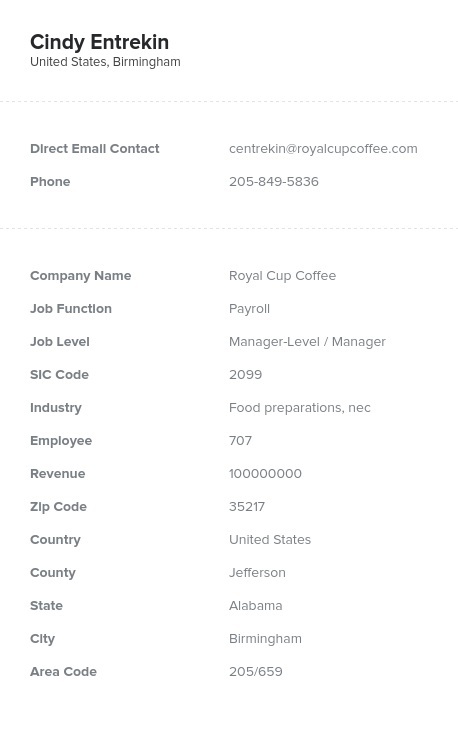 Use this payroll manager email list to email leads who would be interested in what you offer. Perhaps you have an outsourced accounting service, a software product, or another payroll solution. Directors of payroll and personnel managers' email addresses are bundled into this high-quality business mailing list. Get the payroll management contacts you need now!